Astor A16 is a wooden hallway furniture equipped with coat rack panel, a lower shelf and shoe rack. 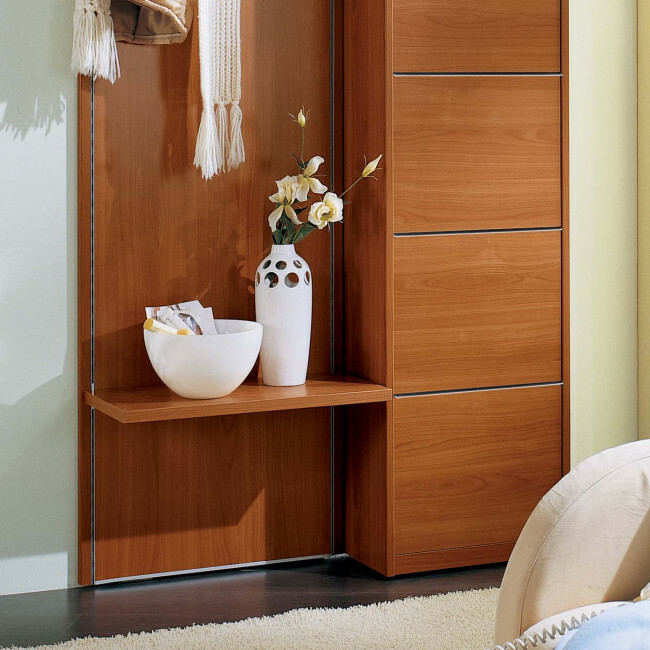 The panel also features a shelf to keep objects, decorative items and bags. The coat rack gathers 6 hooks, 3 big ones for coats and jackets and 3 smaller ones for scarves. 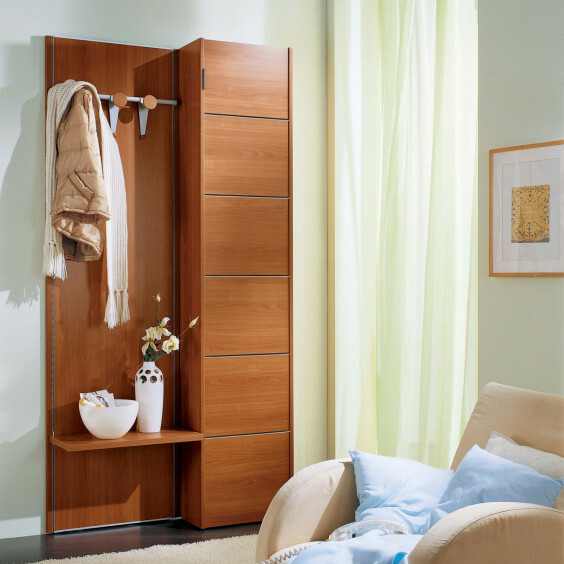 The shoe cabinet is a high slim storage unit with 6 drop down doors and it can hold inside up to 20 pairs of shoes. The effective capacity changes according to the model and size of the shoes. The peculiar structure of Astor hallway furniture includes two hidden racks allowing to fix the shelves and coat hooks at the desired height. You can change the position of the equipment according to your needs and tastes. Note: cherry wood finish shown in the images is no longer available. Use the configuration menu to find out the available finishes. Use the product configuration menu to go through the available finishes and colours for each single element. Cherry wood finish shown in the images is out of production. - 1 shoe rack with 6 compartments with drop down door. Shoe Rack: cm 45 d.26 h.211 in melamine coated wood. Astor A16 belongs to Astor collection, which gathers modern hallway furniture with a high degree of customization. Astor products are characterized by invisible racks which allow to place and move the different storage elements according to your own needs. 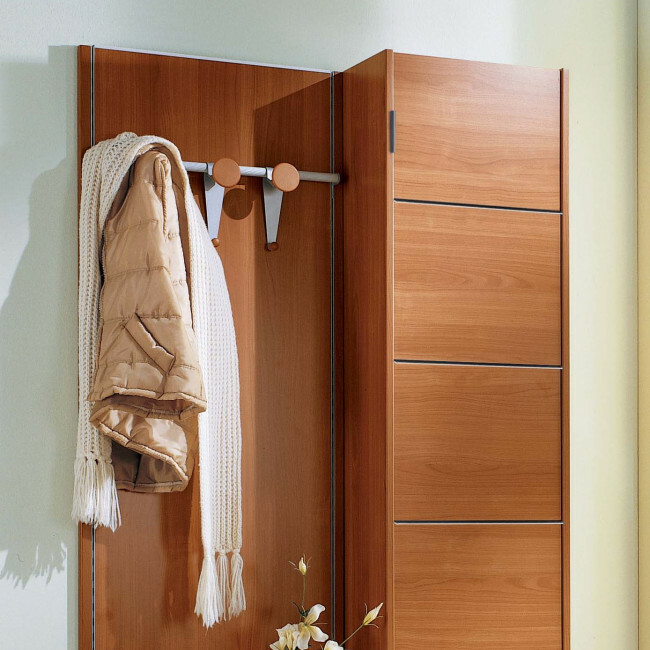 By visiting our shops and Partner Retailers you will receive professional assistance in creating the perfect furniture solutions for your own space.Panels, cabinets, hooks, shelves and drawers allow a great deal of customization in terms of sizes and finishes. Compositions can be equipped with additional mirrors, coat hooks and drawers, shelves, shoe-racks, storage units and ironing kits. Astor is a collection of hallway furniture specifically designed for a wall fastening position wall but at the same time standing on the floor. You can find all customization possibilities of this hallway furniture or the single elements composing it by using the configuration menu.